The Merry Monday #46 challenge this week is to use a bird to make a Christmas card. I used the SU! Language of Friendship set and stamped the image on red card stock with black ink, and embossed with clear detail ep. I used a SU! bird punch to cut the bird out. 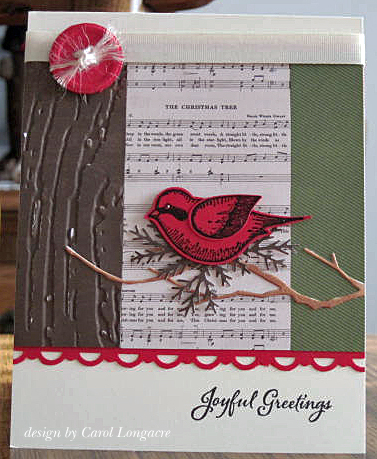 I wanted to use these great Echo Park Very Merry Christmas papers with the music sheet, but I wasn't thrilled with this card once I finished it.........so I made a 2nd one. For this card, I added a 2nd wing to the bird and stamped some legs for him to stand on, adding some pine branches from the Winter Watercolors set. 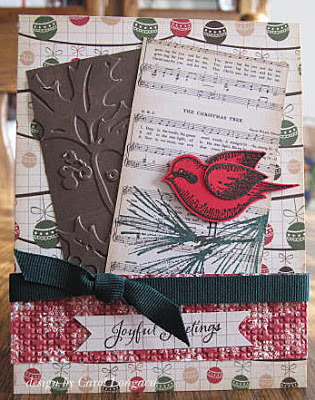 The sentiment is from SNSS and the hunter ribbon is from Pizzazz Aplenty. All papers are from Echo Park Very Merry Christmas pad, and the brown panel was embossed with a CB holly folder, while the lower panel was done with a Sizzix square lattice ef. I just learned about the Cards From the Heart Drive yesterday, but if anyone is interested in donating some Valentine cards for kids, just click the pink heart on my side bar, or click here. There isn't much time left as they need to be received by the end of January, but if you have a few extra valentine's you'd like to donate, I'm sure they'd really make some sick children happy to receive! Please check the details carefully before sending as there are guidelines that need to be followed. Thanks for stopping by and have a wonderful day! It's a balmy 13 degrees here in PA, but I have to venture out to the post office and get these Valentines mailed, so I'll be brave and bundle up :) Stay warm! You are so funny! They are both awesome! I will have to remember you have a tilt fobia! You and I both get to venture out. I debated back under the covers, but I am dressed now and I am trying to tell myself it is not as windy today. LOL! Be safe out there! I do love the first one and I agree with you on the tilted panels being difficult - but it works on your card! I've never seen the bird with two wings and it looks fantastic! Both cards are wonderful Carol. There is a lots of wonderful details and I love that darling bird. Thank you for joining us for Merry Monday this week. Both are wonderful - however, I DO love that second one. All the layers and panels tilted, the DP, image, everything!!! Beautiful cards! Well, I didn't hear her sing on Monday - and what does it matter anyway. Just gotten love the media! LOL! Stay warm.......brrrrrr....I'd just hole up and never venture out I'm afraid! LOL! You sound like me...not thrilled with the first, so make a second! I think they are both quite sweet! LOVE that bird, wishing I had gotten it! Great cards Carol! And i love the tilted panel card alot. You did a great job with going out of your comfort zone! Stay warm sure is a cold week! I'm with you on Beyonce' who CARES...she have a amazing voice...regardless if it's live or taped! It's seem a shame to waste time on such a stupid issues...annoying for certain!! And now I'll jump off my soapbox too!! But it was NICE seeing you there!! While the first card is lovely, I love the added details on the second card! Neither card looks like you were out of your comfort zone! Thanks, Carol, for sharing with us at Merry Monday! And I'm sick to death of hearing whether Beyonce sang live or not. I think they're making way too much about it! I'm sure the president doesn't care and she was singing for him. This weather is something else, I didn't want to venture out in it today. but I had some errands to run, so I just bundled up...Come on, spring! Oh, you did a great job with the tilted panels...didn't notice that you were frustrated one tiny bit. LOL They're both great cards. Brrrrr...it's cold where you live. I am hoping we won't get that cold this year. Yes, I agree with you on the Beyonce thing....who cares! Stay warm & have a great day! WOW WOW WOW Carol I love your cards, absolutely stunning. both are wonderful, love the one with the two tilted panels!!! Thanks so much for joining us this week for the Merry Monday Challenge. Both of your cards Carol are fabulous! I love your second card with the tilted panels - I'm not sure why you're worried about them, as you've done a wonderful job with it! Thanks for joining us at Merry Monday this week! I love both Carol, the branch is fabulous for your sweet bird, such a great mix of papers! Thank you for joining us for Merry Monday this week. Lovely card, I like your colour combo. Thanks for joining us this week at Merry Monday.